I’ve had an interest in my family tree since my Uncle John gave me the names of all my great-grandparents and told me that my great-grandfather Casper Dreimüller emigrated from Germany in 1872 with his brother Michael and father Peter Anton. His uncles Peter Joseph and Caspar also came to the US around the same time but it’s not clear if their sisters also emigrated to the US. A question that I get asked occasionally be friends is what is the point of all of the time that I spend on my genealogical research – i.e. is there a point where I will decide that I’ve done enough. That got me to thinking about defining what my goals are. One of my first resources was a guy named Tom Pick in Denver, Colorado who responded to a post that I made in a German Genealogy group on Usenet. His wife had Dreimüller’s in her tree so he had done some research on that name. At that time in the mid 1990s he worked in a building that had a Federal Archive located in it. He looked up my Dreimillers in the US Census records located in the archive and sent me the info that he found. He also sent me an Excel file of birth and marriage records that he collected on a visit to the southwestern Eifel region of Germany. It contained many Dreimüllers and Dreymüllers. I plotted their locations on a Google Map (blue pins – red pins are the two towns my ancestors are associated with). Sadly, Tom passed away back in 2008. Interesting side note: One of my German contacts is Daniela Dreymüller. 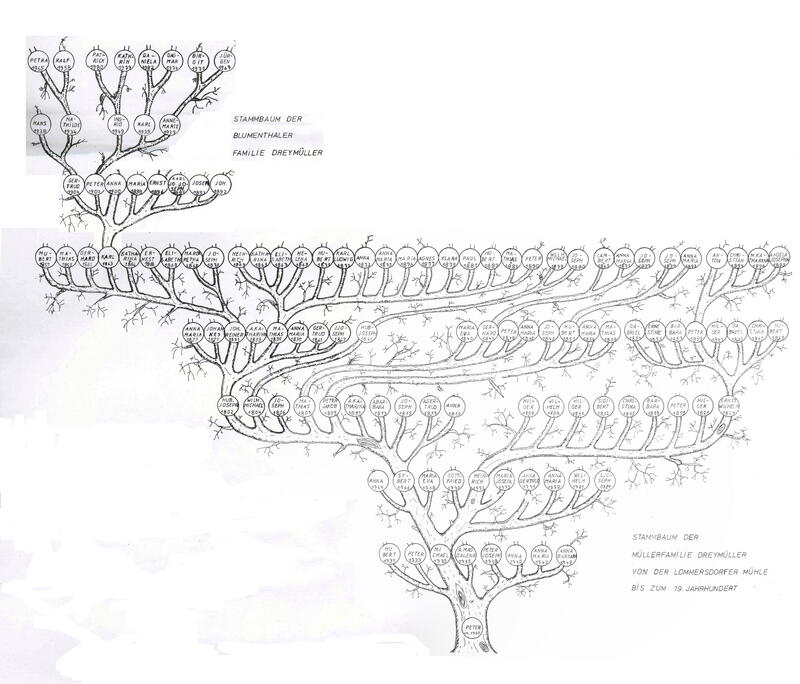 She sent me a hand drawn family tree that her father has that goes back to 1700 (shown to the right). Almost every name on that tree matched up to a record in Tom Pick’s database. Major thanks to Tom who passed away in 2008. Goal #1: Find a living Dreimüller relative in Germany. Status: No luck yet, but I have connected the Wisconsin/Illinois Dreymillers to their 2nd cousin in Germany, Daniela Dreymüller. The advent of the Internet led to my second goal. Back in the late 1990s I ran across the first online phone directory that I had seen on the Internet. My last name is pretty unusual so I was surprised when I a search found quite a few Dreimillers living in New York that I had never heard of. I proceeded to search each state and found more unknown Dreimillers in Illinois, Ohio, Texas, and California. I compiled a list of all the Dreimillers, plotted them all on a map, and selected one person from each geographic cluster and I mailed them a summary of what I knew about my family and asking what they knew about theirs. I’ve since learned that there are also Dreymillers and Drymillers in the US. Goal #2: Figure out how all of the US Dreimillers/Dreymillers/Drymillers are related. Status: The two Dreimiller families in New York (located in Albany and Mechanicville), the Solon, OH family, and Huntington Beach, CA are descendants of my 2nd-great-grandfather’s brothers. As my research continued I discovered that my paternal 2nd great-grandparents came to the US between 1860-1875 and my maternal 2nd great-grandparents, who were all Irish, came over in the late 1840s and early 1850s. While I’ve been able to trace back some of my paternal ancestors to their native country, it took almost 20 years before I was able to track back one of my maternal ancestors to Ireland. My maternal ancestors all came over during the famine in Ireland so I assume that was their motivation, but my father’s side is less clear. Goal #3: Connected all of my 2nd great-grandparents to their home country and learn more about why the left and came to the US. Status: 4 of 8 paternal great-grandparents and 2 of 8 maternal great-grandparents have been tracked back to their home country. My German ancestors may have left due to hardships caused by the Franco-Prussian War (July 1870 – May 1871). The only photo that I’ve found of my mother’s paternal grandfather Charles Philip Connor is a very low quality scan from a group photo in a newspaper. Other than his height relative to everyone else, I can’t make out any features in that photo. I once visited a house where he lived for 30 years in Arlington, MA and the current home owner told me she bought the house from a woman who I figured out what Charle’s daughter. The home owner told me that when they moved in they found a box of photos in the attic. Unfortunately, she didn’t know what became of them. I left her my contact info and followed up a couple of times over the years since but they’ve never turned up. Argh! Once I started using Ancestry.com I found myself following the trails of people who weren’t my direct ancestors. At first I wasn’t sure if that was worth my time. Charles Philip Connor was always assumed to be an only child. Nobody had ever heard any mention of siblings. His parents were Daniel and Mary Connor and unfortunately there was more than one couple with that name in Boston in the US Censuses. I eventually found a marriage record for my Daniel and Mary in Ireland which then helped me figure out which couple they were in the US Census which then led to the discovery that Charles Philip had a brother Jeremiah and two sisters. Following Jeremiah’s descendants eventually helped my find Charles Philip in the 1930 US Census. He was listed as Chas. Connor and living with Jeremiah’s window and some of her children. I also found Charles’ son Francis living with one of Jeremiah’s daughters’ family in the 1940 US Census after failing to locate him otherwise. This made me realize that photos of my ancestors might be in the hands of non-ancestors. Goal #4: Finding photos of everyone possible. I think photography started to become popular around 1840 so I’m using that date as my target – any ancestor who was alive after 1840 might have a photograph of them out there somewhere. Back in early 2012 Ancestry.com introduced a new autosomal DNA test. They had previously offered Y-DNA testing (paternal line only, males only) and mitochondrial testing (maternal line only, males and females). I had been keeping my eye on the 23andMe DNA test since I first read about it in 2007 but it was priced was way outside of my budget ($999 initially). So, when I saw AncestryDNA was introducing a new test that would be priced at just $99 I immediately ordered a kit. That was the first of many DNA tests that I have taken. I later discovered that I could upload my DNA results to GEDMatch.com and eventually learned about the Lazarus tool which can be used to piece together a DNA kit for someone who hasn’t or can’t test (like my deceased parents) by comparing their descendants (my sisters and I) to their relatives (my uncles, aunts, and any cousins – 1st, 2nd, 3rd, etc). Anything that my siblings and I share with my paternal relatives is DNA that we got from our father and the same goes for my mother. So the more relatives that test the more complete the kits for my parents are. I can then use those kits to search for matches and theoretically would get fewer false positives than my sisters and I get and it helps identify which side of my tree my matches are on. Goal #5: Encourage my relatives to take a DNA test. Status: Only my paternal side, all 6 cousins have tested as well as 2nd cousins who are descended from my father’s paternal uncle (1 test in process) and two aunts (3 completed tests) and his maternal aunt (2 completed tests). On my maternal line an aunt, uncle and a maternal cousin (son of a different aunt), have tested as well. So I have someone from every one of my mother’s siblings who had children, everyone descended from my father’s two brothers, at least one person from each of my paternal grandfather’s 3 siblings who have living descendants, and two from my father’s maternal aunt. I also have found a 3rd cousin on my maternal side and two 5th cousins on my paternal side who have tested. My father’s kit is 3,289.8 cM (91.7% complete) and my mother’s kit is 3,444.2 cM (96.0% complete). Excellent progress on this goal! I’ve taken a Y-DNA111 test (paternal lineage) and a mitochondrial DNA test (maternal lineage – full mitochondrial sequence)). I’ve been able to track my paternal line back to Johannes Treymullen (1630-1690) thanks to a couple of German genealogy books that I bought titled “Ortsfamilienbuch der katholischen Pfarrei St. Martin in Nohn (Eifel) mit den Filialorten Borler (Heyer), Dankerath, Senscheid und Trierscheid” and “Die Bevölkerung von Üxheim um 1650-1802 mit Ahrdorf, Ahütte, Dreimühlen, Flesten, Leudersdorf und Nollenbach Rekonstruktion der verlorenen“. I’ve found a web site (Google Translate version in English) that suggests that my family name may have originated back in the 1200s as Drimollen. My maternal line has been much harder to follow. I have 4 perfect matches (0 genetic distance) but unfortunately due to the infrequent mutations in mtDNA that only narrows down the time to a most recent common ancestor to between 125 years with a 50% confidence interval and 550 years with a 95% confidence interval. Only one of my perfect matches lists their most distant maternal ancestor and it’s not a name that I’ve run across in my tree yet. One other has a tree linked to their account but it only has 3 generations on it. There are 8 matches with a genetic distance of 1 and half have trees but no familiar names on them. To complicate matters, the only place that I’ve see a reference to the maiden name of my 3rd great-grandmother on my maternal line she is listed with the same last name (McGrath). It’s possible that the person recording the info put her husband’s name there accidentally so I can’t even be sure that’s her actual maiden name. Goal #6: Confirm the maiden name of my 3rd great-grandmother on my maternal line and then continue pushing back until I’m able to find a maternal line connection to one or more of my perfect FMS mtDNA matches.